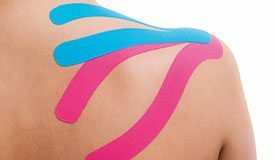 The Medical Taping Concept is a taping method, Who not only has a stabilising effect on joints, but allso acomplishes better blood- and lymfe circulation. (Tension-) headache and nerveache, influenced by organes like stumachproblems. With Medical Taping we use different tape, called CureTape. This tape is more functional then the classic white sports tape: it supports and activates the restoration of the body without contravening the movement of the joints. Activation and regulating of the bloodflow and lymfe drainage. The elastic Cure tape lifts the skin by the special way of taping. the pressure underneath reduces in the pain area, after which the bloodflow and the lymfeflow improves. The pressure on the pain receptores lessens of dissapears totally. Cure tape will stay for several days, even during showering, swimming which makes it a 24 hour treatment. Sometimes, with the use of Medical Taping there will be a beter hydration of correction of the movement while classic tape is nog strong enough. A lot of athletes use it now to give them more strength and less problems during important games.